Budgeting is one of the best practices you can use to effectively manage your household spending. Here are 8 Reasons Why You Need A Budget. One of the primary reasons you need a budget is to create a blueprint or a structural foundation to put your financial house in order. A budget gives you a sense of your financial priorities and your hard earned money a sense of purpose. Without having a budget, your money habits could become chaotic, which can impact the entire household not to mention the “state of your union.” Another big reason you need a budget is to help keep your household focus on its priorities and reduce unnecessary stress. Do you control your money or does your money control you? That is the question. A budget can provide you timely and important insights about your spending. By taking a quick inventory of your spending habits you can learn a lot about yourself and make adjustments when necessary. A budget helps keep you in the drivers seat. Make sure you are controlling your money, as opposed to the other way around. After all, you cannot make life decisions about your finances if you have no control. Don’t ever be at the mercy of your money. The third reason you need a budget, is because it helps disciplines our socio-psychological relationship to money. We all have socio-psychological relationship to money. Whether we have little or a lot we measure our lives and our standard of living by how much money we have or don’t have. Overall, our obsession with money is ongoing and often moves between our wants and needs. Budgeting can help keep us focused on our needs as opposed to our wants. The fourth reason you need a budget is because it can help you manage your money more effectively. It can help you build a strong base for your financial future. If you’re trying to build financial security there is very little chance of you getting there without understanding how to budget. Having and using a budget helps you establish that strong sense of financial discipline. The fifth reason you need budget is that it helps you to establish and achieve financial goals. By constantly reviewing your monthly financial picture you learn how best to approach you personal financial goals. You also learn what may be the best steps to take in realizing those goals. Without having any idea about your personal finances, it is very difficult to plan and execution on strategies toward goal achievement. Having a budget is very key to planning and goal setting. Reason number six is that budgeting helps you to clearly define your expenses, whether they’re fixed, variable, monthly, quarterly or annual. Managing expenses is one of the key problem areas for many households. A budget is the ultimate tool which provides much needed insight on your expenses as you deliberate on key financial decisions. Having a budget brings with it an understanding that everything adds up. Remember the old cliché, “a penny saved is a penny earned.” The truth is small purchases add up, small fees add up and small savings add up as well…bottom line is everything adds up. Making sure you’re on the right side of the addition formula. And that you are clearing making the is our seventh reason to underscore the importance of budgeting. And finally, the eight reason you need a budget is because it has enormous impact on your family, particularly over time. Budgeting makes a difference in terms of day-to-day living, saving for college, purchasing a new home, automobile or saving for retirement. Make it a group effort. Although budgeting may be seen as a bit restrictive for a family in the short-term, it can be super beneficial in the long run. In terms of engaging the family, make it fun. Provide incentives for cooperation –such as a movie night, or pizza night or ice cream night—you get the point. This may be a good way to involve the fam, but just make sure that you account for those cool incentives, in your budget. Most of us have heard the terms,“saving” and “investing” at one point or another. These terms are often referred to in the context of a financial conversation. Much like myself, you may have heard these terms as a child while listening in on adult conversation. As an adult however, I still found myself needing some clarification on the differences between the two. Over the years, I have learned that they are two uniquely separate concepts. And furthermore, getting a better understanding of the differences between savings and investing can be extremely valuable in promoting your financial well-being. The word “saving” often brings to mind the act of putting money aside for the future…which is absolutely correct. By definition it is income not spent or as economic theory refers to it, “deferred consumption.” It is also important to note that “saving” differs from “savings.” Saving refers to the act of increasing one’s assets, whereas “savings” refers to one part of one’s assets (such as a CD or savings account). Some examples of saving methods include bank insured deposit accounts, such as savings and money market accounts, and non-bank insured accounts such as mutual funds. And, of course, there are other types of unconventional saving methods such as, saving or investment clubs. The key is to find a method that is most suitable to you. 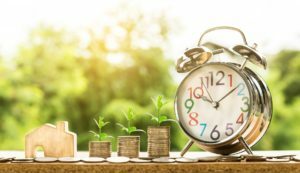 One of the key differences between saving and investing is that savings tends to help prepare you for unforeseen and future expenses such as emergencies, college expenses, a down payment on a car or new home. This is primarily why savings needs to be fairly liquid. Many financial experts such as Dave Ramsey, recommend that households have an emergency fund of between 3-6 months worth of household expenses saved to deal with household emergencies. As we all know – life happens. Having an emergency fund also helps to ensure that you’re not dipping into your general savings or other long term assets. The concept of investing involves more than just putting money aside for future expenses. It has direct impact on your long term financial goals. Investing is the step by step strategic process you engage to manage and maximize the assets you have acquired over your life. It takes into consideration a high level of insight and discipline when it comes to debt reduction, retirement planning, tax planning, wealth accumulation and personal interests. In sum, it is a key step in securing your personal legacy. Many experts refer to investing as the vehicle that, “allows your assets to work for you.” Although there are literally hundreds of ways in which to invest, having a clear understanding of your investment goals is critical to any investment strategy. Investing, is not always about money. For example, it can be viewed in the context of managing your time, getting an education, self-development, or even starting a business. The thing to remember is that investing is about maximizing your financial viability for the long haul. That said, learn to be patient and disciplined. Don’t be in a hurry. Follow your strategic plan, and be consistent as you work to achieve your investment goals.